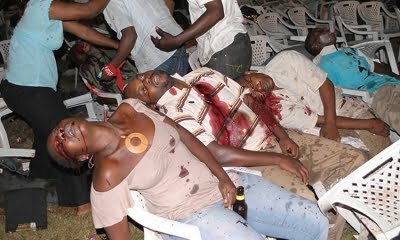 July 11th 20101 Kampala bombing - Internet Photo. As the East African region remains vigilant against terror attacks by Alshabaab and other terrorism agents, Muslims in Uganda – especially ladies who wear long dresses that cover their entire body – have expressed their discomfort that the general public causes to them. Since 11th July 2010, when Alshabaab terrorists targeted two places – Ethiopian Village restaurant in Kabalagala and Kyadondo Rugby Club – and set two bombs that claimed the lives of more than 70 people, Ugandans have been on the lookout for any suspicious-looking people. This followed many alerts from the Ugandan police force to the public to be vigilant against further attacks. Police have several times cautioned the members of the public to report any suspicious objects abandoned on the roadsides such as bags, guns, flasks, laptops and others. The public however seems to have gone beyond observing these objects. Some have reached an extent of looking at Muslims in a suspicious manner. Others have branded the Muslim ladies wearing Hijab as members of Al-shabaab, which has angered the Muslims. Muslim ladies appeal to members of the public not to look at them as terrorists because of their dress code. They say they have had these dresses even before terrorists attacked Uganda. I encountered one Muslim lady who did not want her name disclosed and she expressed her discontent to me when she said many people in the city centre stare at her every time they see her wearing her Hijab. “Whenever I am walking, people stare at time and it makes me feel uncomfortable,” she said. She said she faced it rough one day when she took an evening walk with one of her Muslim girlfriends. They went to venture around newly constructed warehouses in Kyebando, a city suburb, where they found a security guard who shouted at them and commented on their dress code. She said she used to walk around the warehouses because she loved touring and discovering new places. “We used to visit those warehouses on permission of the watchman but that day when I went with my friend, the guards asked us what we were going to do there,” she said. The two were finally granted entry, but when they reached midway the other guard ordered them to stop. “He then pushed us out of the gate saying he was not sure whether we came with an intention of bombing the area,” she said. That after the two had been forced out, the guard started shouting and insulting his juniors why they had allowed women dressed like that to access their premises. This lady however said she was not moved by the insults because she got used to them. them Al-shabaab are ignorant. Unlike this lady, her friend was rather pissed off by the insults. That she left the place unhappy. The other lady’s esteem seems to be very high because she believes no one can influence her to change her dress code. Her experience triggered me to inquire from other Muslim ladies who wear Hijab, and for them, they have not encountered any challenging experiences. Nakuti Adia has always put on Hijab and people have seen her several times comfortably dressed in the attire. She said no one has ever stared at her. “For me no one has ever nicknamed me Al-shabaab ever since I started wearing Hijab. I started wearing Hijab since my childhood and I am free to move anywhere with it,” she said. The U.S government may have recognized the need to go after the Al Qaeda infrastructure in East Africa, but the potential for the growth of Islamic extremism and other sources of terrorism elsewhere on the continent has not registered sufficiently on its radar screen. By far the most troubling case is Nigeria. With nearly 133 million people, nearly 67 million of whom are Muslim, Nigeria is Africa’s most populous nation and possesses its second largest Muslim population, after Egypt.